What is the Reassure Guarantee®? 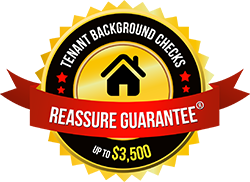 The Reassure Guarantee® is a program exclusive to our company that is changing the way property managers and landlords screen tenants. Simply use our screening service and your tenant may qualify. While we do not make recommendations on which tenants to lease or not to lease to, we will provide you with a full tenant screening report which will include an eligibility determination for our Reassure Guarantee®. If you then choose to rent to an applicant eligible for the Reassure Guarantee® within thirty days of our screening and you have to obtain a judgment against the tenants(s) within 12 months, we will pay you the full value of the judgment--up to $3,500--when you assign the judgement to us according to the terms of the Guarantee®.